This Provencal-esque old house largely dates from the 17th century when it was built by the Count of Grignan to accommodate monks – the former seemingly believing that the latter could offer the village some moral leadership. The building has been the property of several individuals and families during its existence, not least one of Picasso’s girlfriends, Madame de Sourdive. 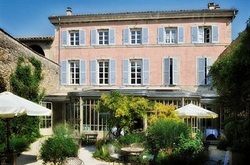 Today, la Clair de la Plume offers seventeen guest rooms, an outdoor swimming pool, bar and restaurant. The border between Rhone Alpes and Provence is just a few miles to the south, with cities and towns such as Avignon and Carpentras easily reached by car.